The Strategic Overlay was presented to Andatura 4 on October 7, 2013. It requires that an account have an active Boost or Upgrade Investor Sponsorship account. 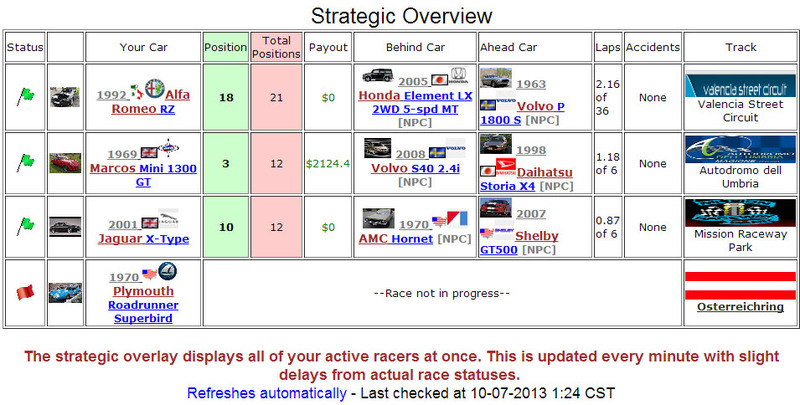 The strategic overlay displays all of your active racers at once. This is updated every minute with slight delays from actual race statuses. The strategic overlay was a feature similar to the “My Racers” tab in Andatura 3. The change resulted in some scale down of the “Active Racers” display on owner pages. Audible Alert added October 21st, 2013. This alert can be toggled on or off within the Strategic Overlay page. If you have NO active racers AND entries remaining, you will receive an audible alert(a car horn honking).